Sitting on the shelf in my studio are four stamp albums. Three of them belonged to my Dad and the other belongs to Helen. He gave her these albums and I have them all for safekeeping. 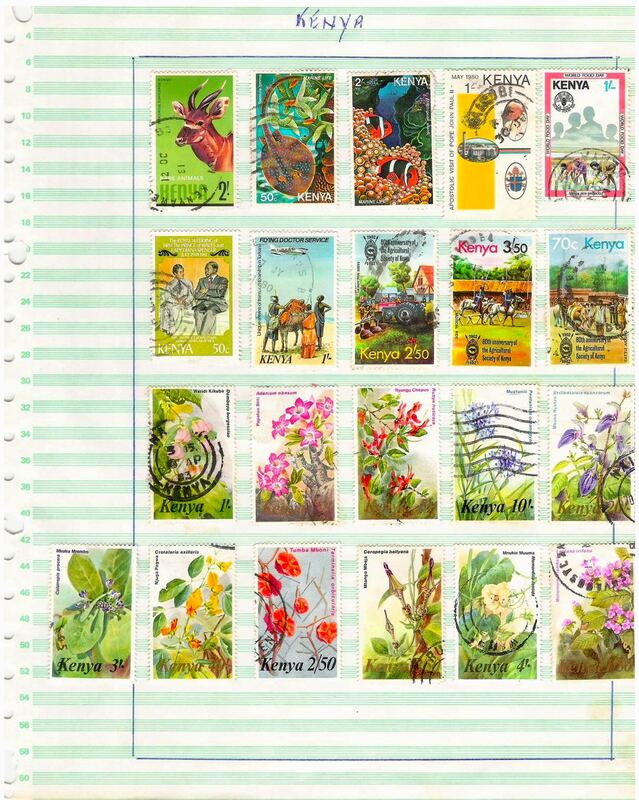 The post’s called loose leaves because in Dad’s ‘swops and to be included’ album are a few Kenyan stamps lying loose. This got me wondering whether they were on the letters I sent Mum shortly before he died in 1994. Maybe I had sent her more afterwards? I really couldn’t remember. Perhaps they were meant for Helen’s album that was started in 1990 when we were on sabbatical leave in Durham and my Dad got her interested in collecting stamps? First, though, I had a good look at the stamps in the Kenya section of my Dad’s ‘world’ album. 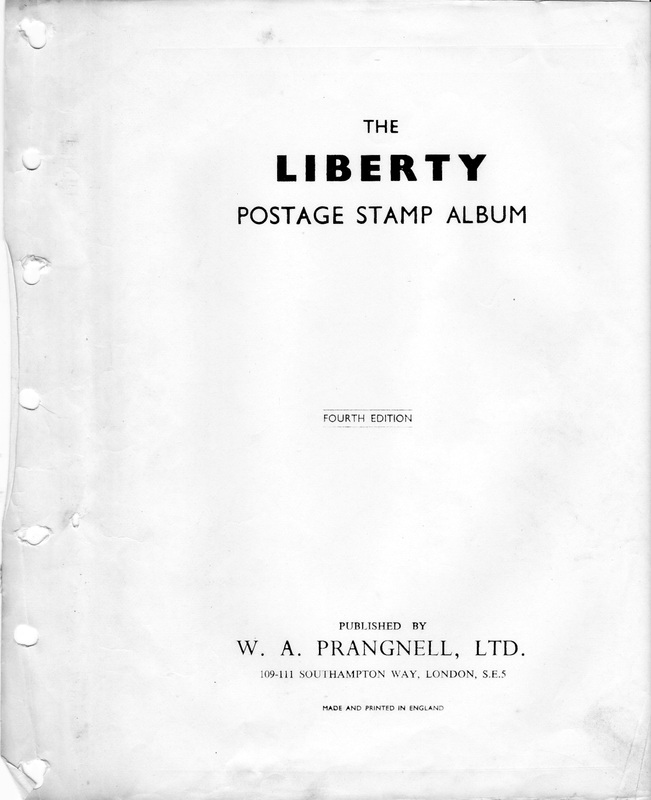 This is a good old-fashioned ring bound ‘Liberty Postage Stamp Album’ dating from the 1950s. A clue to that comes on page 75 where the section for Kenya, Uganda and Tanganyika describes them as a ’A British Colony and Protectorate in East Africa’. Dad, being the thrifty person he was, used the old computer printout sheets I had given him on which to attach stamps I sent. These came on my regular (weekly) letters to him and Mum, I would also include any stamps that I’d saved for him. It’s quite remarkable to see the stamps that I’d purchased, watched torn off their sheet, then licked and stuck down on an envelope and, lastly, seen being franked on the heavy wooden counter of the post office. And where were the post offices? It was there that we bought stamps and posted letters, aerogrammes and Christmas cards. Parcels from relatives in England were also collected once you’d received the notification that something has arrived – you always hoped there was no duty to pay! Not surprisingly you can see the franking ‘Nairobi’ on a good number of the stamps. Another one I expected to see was KenyaWestlands – because we shopped in Westlands regularly and sure enough it’s there – along with Ruiri from the time we lived out on Ruera coffee estate from 1983-5. They’re both found in the bottom row of flowers stamps. 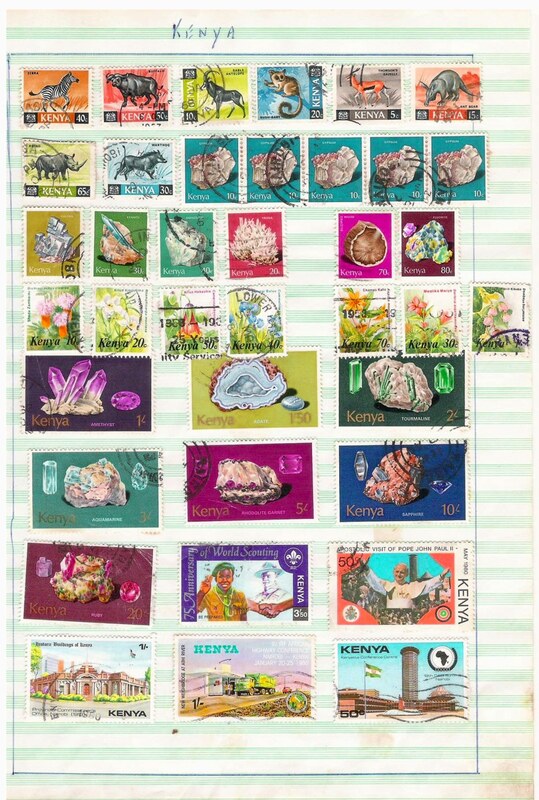 Elsewhere on these pages you can make out stamps franked Lower Kabete, Malindi, Mombasa and Machakos. In the page below you can see the green Tourmaline 2/- stamp that was always a favourite of mine as was the purple 1/- Amethyst. The looseleaf stamps almost certainly postdated 1994. They were probably sent to me in South Africa and I will have sent them on to Mum. On the 10/- Cinnamon-chested Bea-eater I can make out the Thika postmark so this was probably sent by a Kenyatta University colleague or friend from the coffee estates around there. The 50/- Yellow-Billed Hornbill is post marked Gigiri so I’m pretty sure this came from Backson Sibanda, a former PhD student, who was working at the UNEP headquarters there. Unfortunately I can’t make anything out from the 100/- Hadeda Ibis stamps. The last stamps are on an aerogramme sent to me on 30 June 1997 by David Roden. He was running the Marich Pass field centre in West Pokot. I’d recently visited him – it was a memorable trip – and he was writing to acknowledge receipt of the geological reports I had sent. Aerogrammes had four panels and three folds, you wrote your letter and then folded them up and sealed them with small flaps along the side. If I remember rightly they were cheaper than letters! Once I got back home to South Africa there were still a few puzzles about Dad’s time in Iceland that were left to be solved. They have nagged at me for quite a while and it’s only now I’ve resolved them that I have been able to put these posts together. The first one: where was Dad’s band playing? 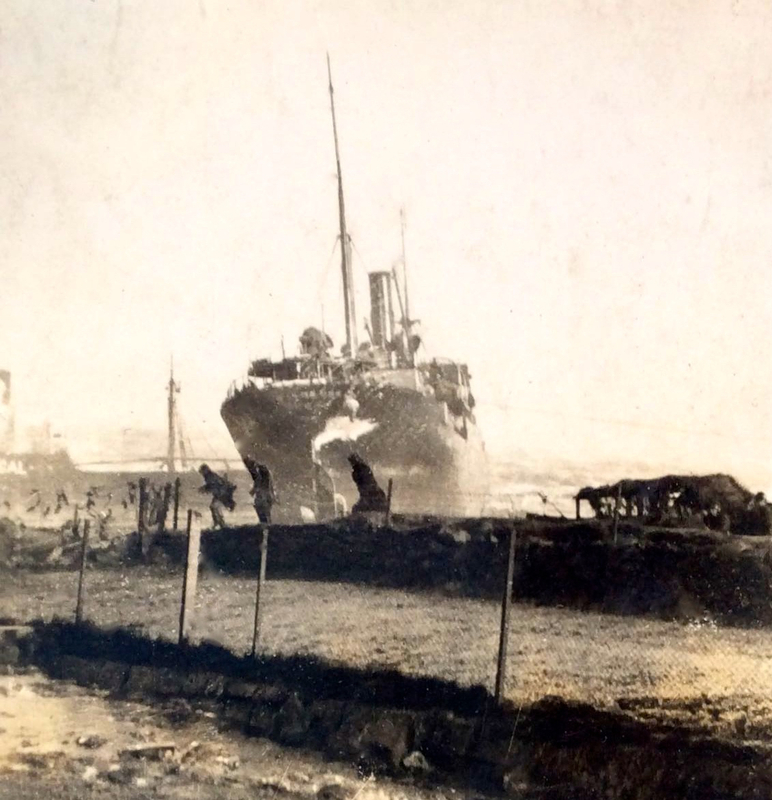 Our Icelandic friend Guðrún Gísladóttir told us that there were very few buildings of that size in Reykjavik at that date so surely I could find it ….. and after all Dad had written the name of the place on the back of the picture. Try deciphering that handwriting! I spent a lot of time searching the internet doing variations of the name with no success until I got a bit of inspiration. Perhaps the end of the word spelt ’skollin’ – I know that skola is school in Swedish so maybe it was a school? 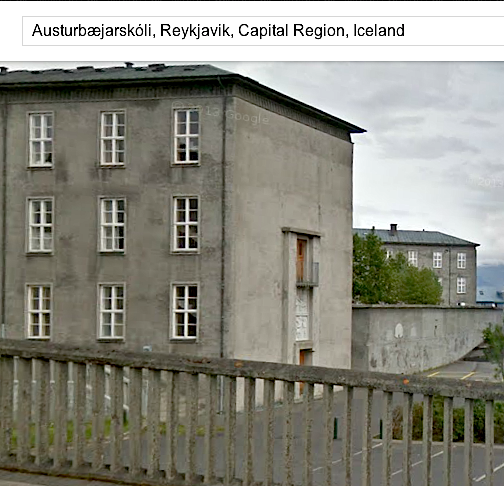 Wikipedia quickly solved the problem – there was a school called Austurbæjarskóli in Reykjavik and I soon found it in Google Earth. It was old enough and I could see from Google Earth’s street view that the outside of the building looked right. What’s more there were pictures of the playground in Flickr and it’s easy to see it’s the right place. So now I knew where the band was playing: the school was just outside the city centre a couple of kilometres away from the hotel we had stayed in and also near the old airport. 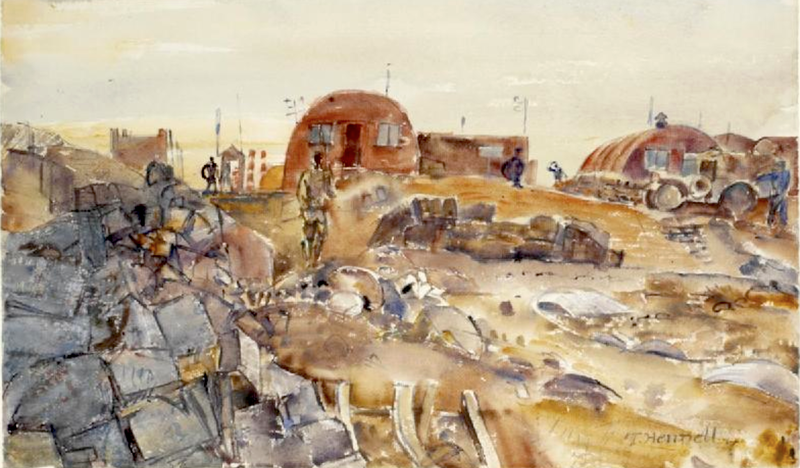 It was late one evening a week or so after this that I stumbled across some old paintings and sketches by war artists kept in the Imperial War Museum website. 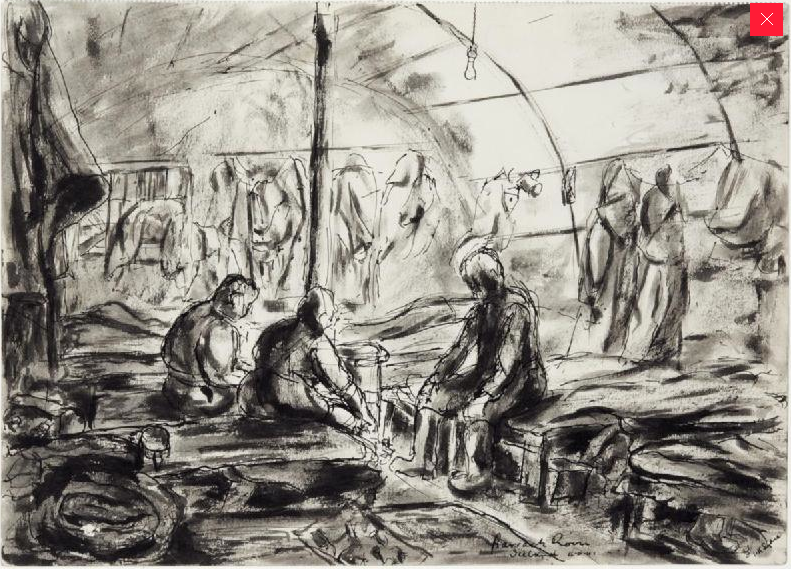 I was looking for life in Nissen huts in Iceland when Dad was there. 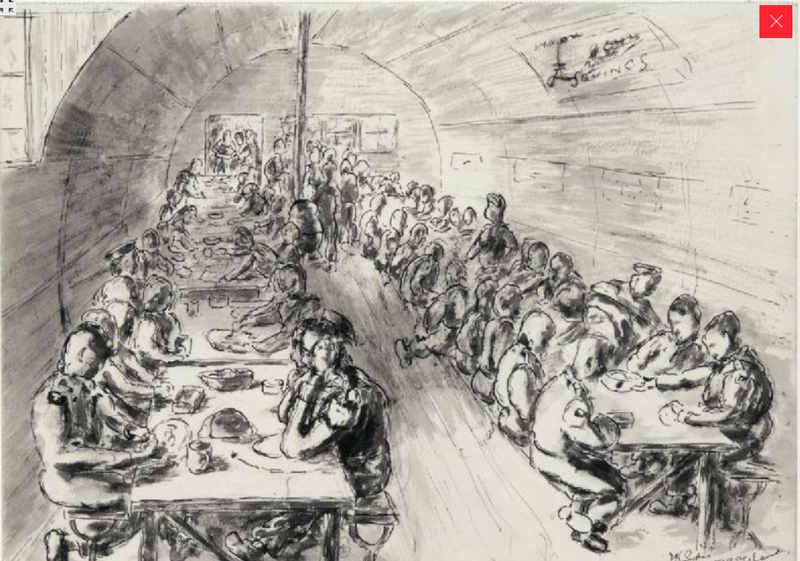 These two are from October 1940 and they give a good impression of conditions in the barracks and canteens. 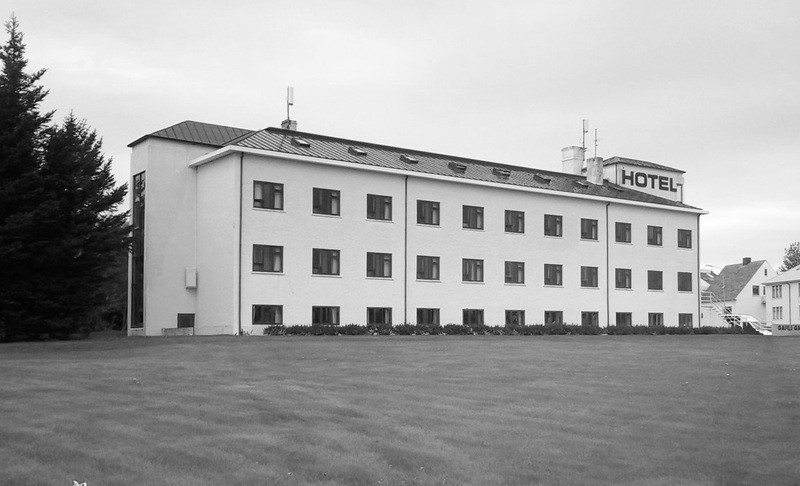 Then I hit the jackpot because there were also two colour pictures of Skipton Camp, Reykjavik. I was thrilled – after all his regiment was based in Skipton so surely this must be the camp that he had helped to build and then stayed in? 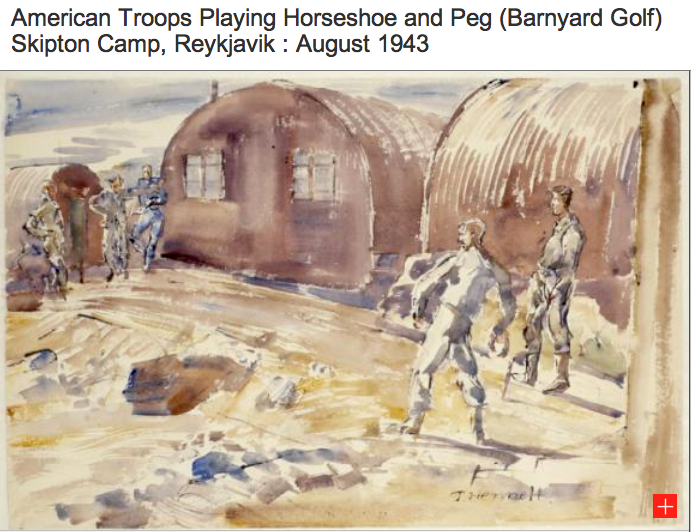 The last part of the puzzle dropped into place when I tracked down a description of Iceland’s Second World War military camps in the Árni Magnússon Institute website. There is a really clear aerial view of Camp Skipton (and Camp Bingley, Camp Keighley, Camp Harrogate ….). It’s the untidy collection of Nissen huts right next to Austurbæjarskóli (which is the large building at the top of the picture). 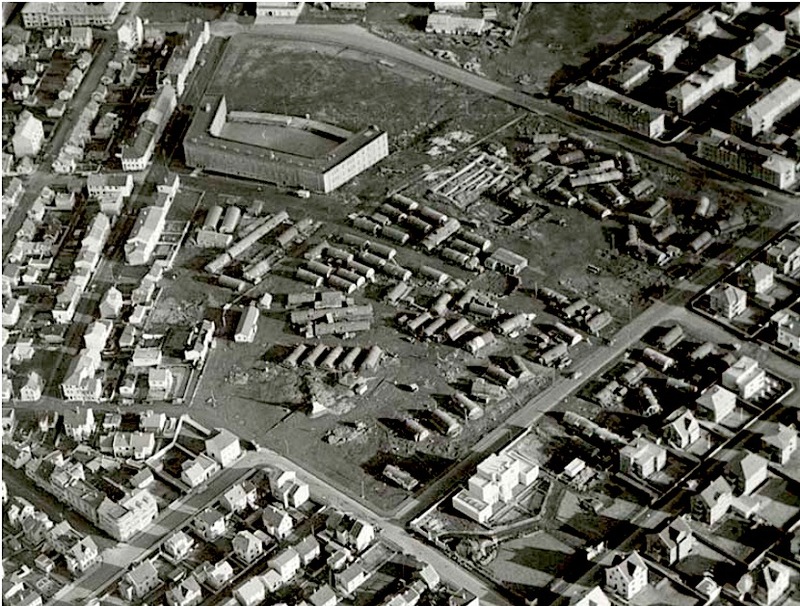 After the war the camp must have been cleared when the striking Hallgrímskirkja was built there. Here’s a photo of it from our hotel window. What’s more we had walked over to the church and right around that area like so many other tourists. There won’t have been many, however, who were walking in their father’s footsteps. The big problem with trying to follow Dad’s footsteps in Iceland is that I really had no idea where he had been. I had plenty of pictures of him outside Nissen huts in the snow, with his leg in plaster, on a motorbike etc but usually no clue as to where the snaps were taken. There is precious little about his regimental history in Iceland on the internet. All I had to go on were some of the places (if I could read them) on the back of his photos and hope for some good fortune when we were travelling in Iceland. I knew he had been to Kleifarvatn as there’s a nice picture of him (front right) and his mates standing in the blueberries on a summer evening at an outside mess. Kleifarvatn is clearly written on the back as you can see and I think the lake’s visible in the back left of the picture. A quick search in Google Earth and you will find the lake (vatn) just south of Reykjavik. It’s also the subject of one of Arnaldur Indriðasons Icelandic thrillers (The Draining Lake). 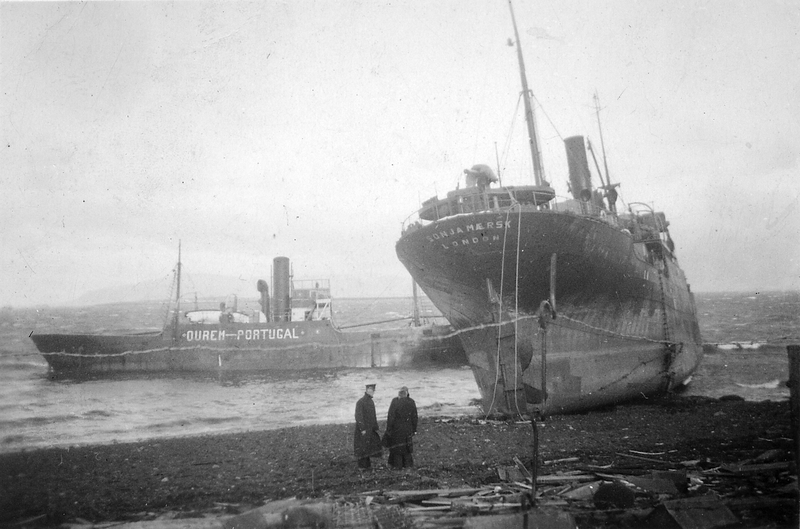 More disappointing was his picture of the cargo ship Sonja Maersk aground in Reykjavik bay, February 1941. 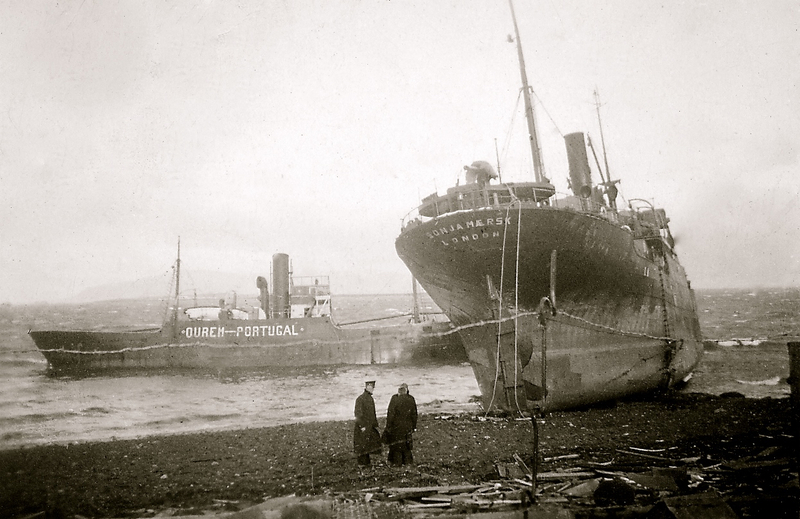 We went down to Reykjavik harbour and scrutinised the impressive display of shipping disasters, sinkings and runnings aground but there was no mention of the Sonja Maersk. Things looked up after that. 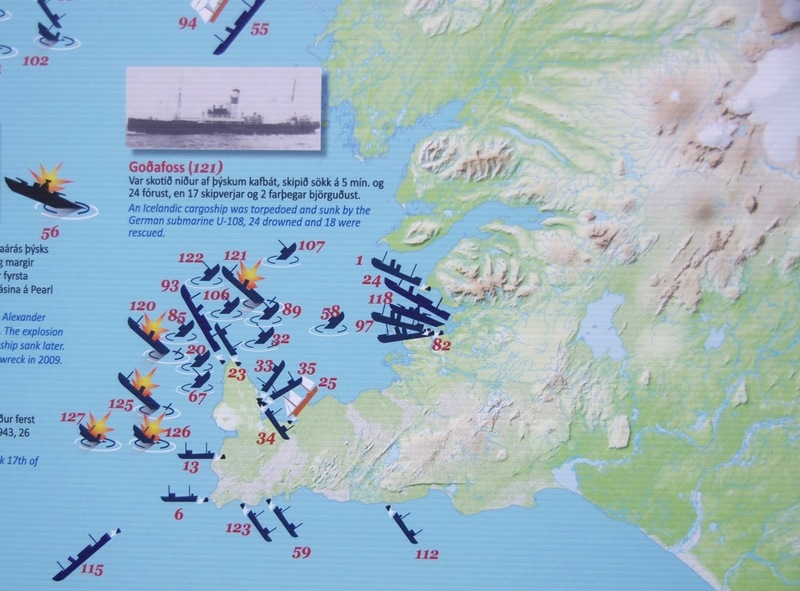 We travelled north and on our way around Hvalfjörður we visited the little war museum on recommendation of the very helpful staff at Tourist Information in Reykjavik. On the wall the owner proudly showed us his copy of the map of World War II British Army operations, marked top secret. Apparently the original is still displayed in the British Ambassador’s office at the Reykjavik embassy. 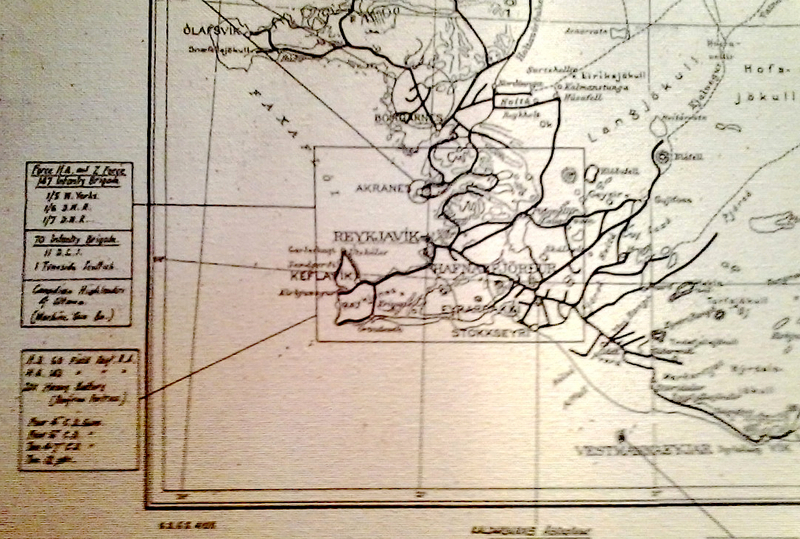 You can just make out in the box to the left of the map that the 49th Infantry and Dad’s battalion (1/6 D.W.R – First Sixth Dukes West Riding) were stationed in South West Iceland around Reykjavik. On our return to Reykjavik we had the great good fortune to be staying at the cheapest accommodation for the conference (Iceland is an expensive place!). 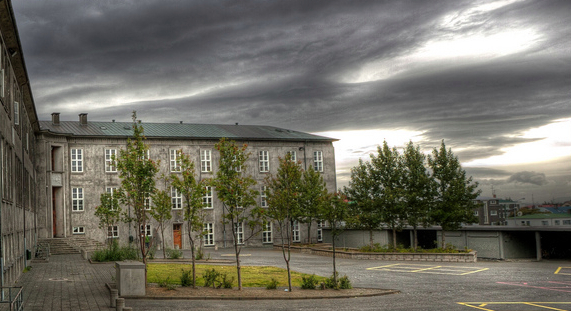 Lo and behold Garður Hotel (Gamli Garður, old dormitory) turns out to be the University of Iceland’s oldest surviving building and the hotel website says it was occupied by the British army from 1940. There’s even a very small picture of a row of Nissen Huts in front of the hotel which you can clearly recognise from my own picture. Now I could begin to feel some connections. We were staying in a building that Dad had probably been to at some point. 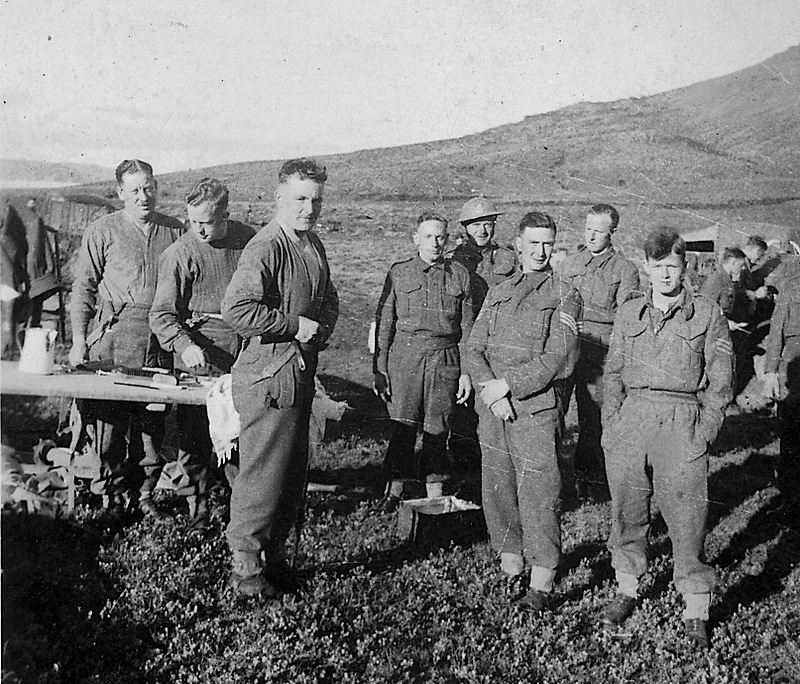 It was located just beyond the Iceland’s original airport which the British army had built. Some months after we got home to South Africa I was finally able to piece together exactly where he had stayed but that’s the subject of my next post. Dad’s regiment in World War Two was the 1st/6th Duke of Wellington’s (the Dukes) which was based in Skipton. He had a tough time during the war since they were part of the rearguard defending the British Expeditionary Force at Dunkirk and then saw action in Normandy in 1944. 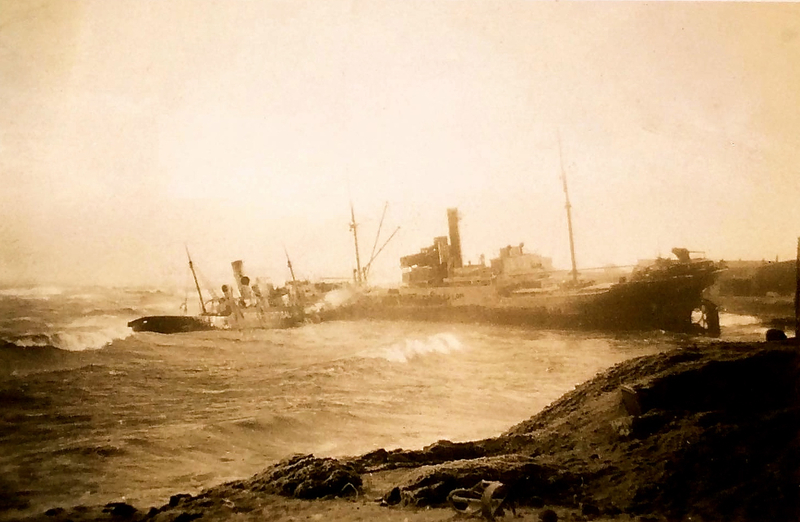 In between times the Dukes sailed for Iceland to join the allied occupying forces in May 1940 as part of the 49th Infantry Division. 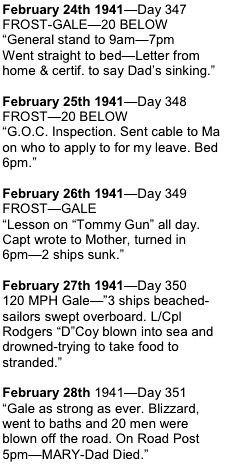 They returned in April 1942. The only time I can remember him talking about Iceland was to Katy the first time they met in Glasgow (this would be in 1974). Katy had recently come back from a holiday there and he reminisced a little. 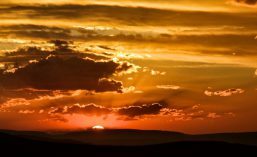 I remember he said that he didn’t enjoy the winter with its cold, rain, snow and dark though that was mostly because they were so poorly equipped. 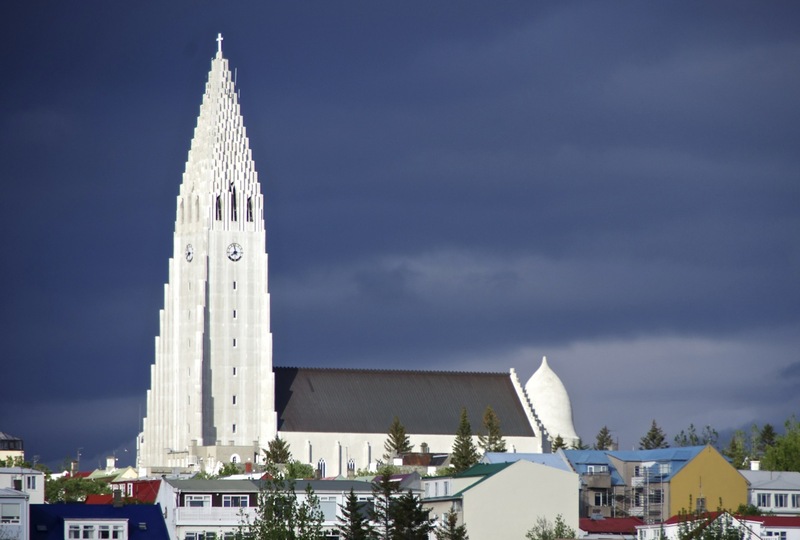 In June 2013 (seventy one years after he had left) Katy and I went to Iceland for a conference and for me it was a once in a lifetime opportunity to retrace Dad’s footsteps – if I could find them. 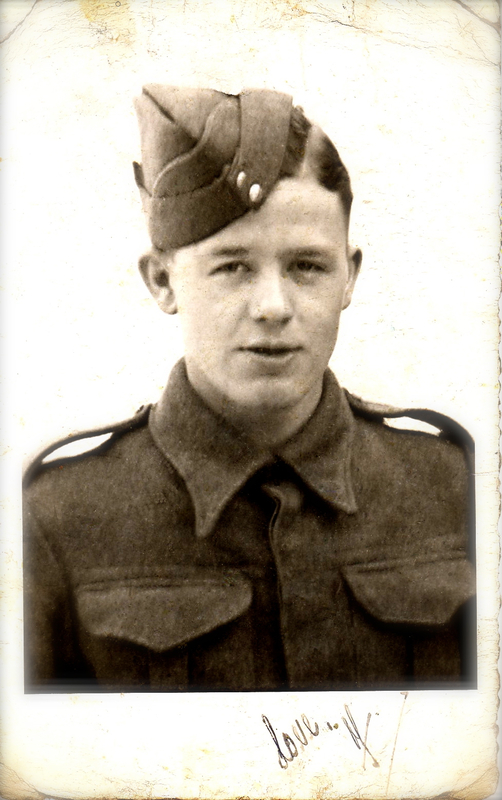 I was helped because I have an album of Dad’s wartime pictures. I scanned them from an old brown photo album of Mum’s. That was my first surprise because the photos were glued in and as I carefully tried to prise them off the page I found that dates and comments might be written on the back of them. Sometimes it was Dad’s famously indecipherable handwriting (see below). This has led to some serious detective work to try and figure out just where he had been. That’s the topic of my next post on Dad in Iceland …. Before I get round to that though here is a poignant set of pictures. The first is a postcard from Dad standing next to one of Iceland’s renowned Nissen Huts saying ‘Every time you look at this it will remind you to send me the snaps you promised.’ The picture of Mum is dated January 1941 and it says (on the back) ‘It was freezing like hell when this was taken so if I look queer it’s because I am cold.’ Perhaps she mailed this back to him in reply? The building behind her doesn’t look like anything I recognise in Skipton so I think this picture was probably taken at Saffron Walden where she was studying to be a teacher.